Let me explain. I am a toy collector. For my entire life, I have been attracted to the bright, shiny plastic objects in their colorful packages. I have a particular fondness for rack toys, the kinds of cheap-o toys that you find in drug stores, groceries and other odd places. I enjoy the mystery of the obscure manufacturers, the bizarre television tie-ins and the charm of the cheapness. Basically, this book had me at the title. But it exceeded expectations. 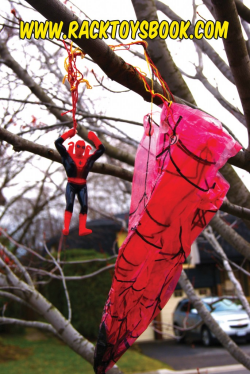 Brian Heiler has assembled a lavishly-illustrated trip down the memory lane of cheap, laughably crappy toys, the kind you used to bug your parents to buy for you. Brian is the proprietor of Plaid Stallions, the way-cool retro nostalgia website, and he has his hands in The MEGO Museum and Aquaman Shrine, too. With Rack Toys, Brian has put the spotlight on what was until now a sadly-neglected area of toy collecting. Rack Toys are the red-headed stepchild of the toy industry. They don’t get no respect. 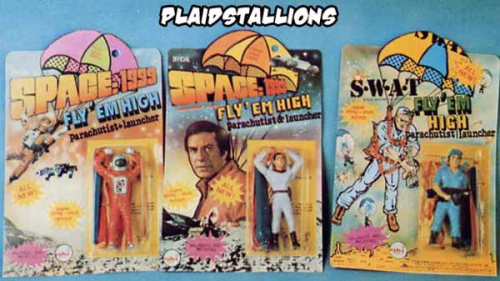 In fact, much of the time it seems like the people who made these toys didn’t have any respect for them either. 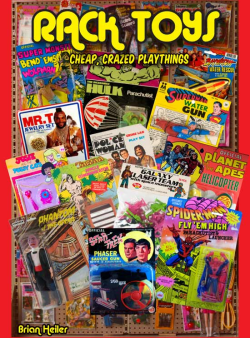 After a foreword by Pop Culture guru, Jason Lenzi, the book kicks off with an explanation by Brian of what rack toys are, and how his father was a “rack-jobber,” who went from store to store stocking these treasures of trinketry on the store pegs. The book is then divided into chapters describing the different types of rack toys, and thousands of color pictures with often-hilarious captions follow. “The Shadowmobile.” Some of the superhero toys feature characters who were obscure when these were made, like Ghost Rider and Spider-woman. 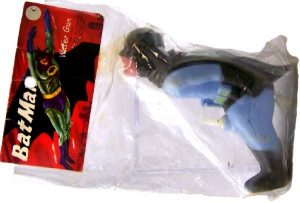 Others show off the often slapdash nature of the rack toy business, like the Spider-man police badge with handcuffs and gun, or the Batman slide rule. There’s an entire chapter devoted to monster and Halloween toys. Another devoted to futuristic science fiction (largely The Planet of the Apes and Star Trek), and what may be the funniest chapter of the book, a section devoted to really cheesy tie-ins to hit and not-so-much-a-hit TV shows. 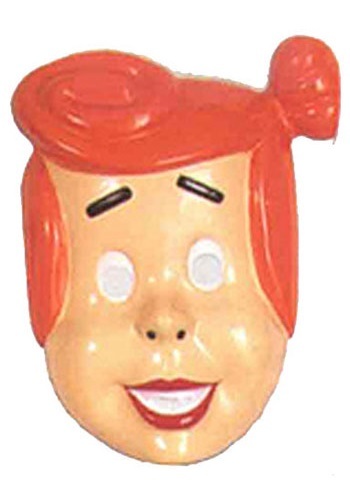 The tickle of obscure old shows on your fading brain cells continues with the section on Saturday Morning Cartoons, when you lay our eyes on toys based on The Mighty Hercules, The Groovy Ghoulies, Captain Scarlett and The Banana Splits. This section also includes one of my favorites in terms of cheesy non-sequitors, the Woody Woodpecker Submarine and Diver set. This is what the letters “WTF” were invented for. We also get a chapter devoted to gloriously generic toys like Poopa-Troopers, squirt rings and a variety of takes on little green army men. The final chapter is devoted to a subject near and dear to my heart, the cheesy knock-off. The cheap, crappy imitations of licensed toys in this section are worth the price of the book. 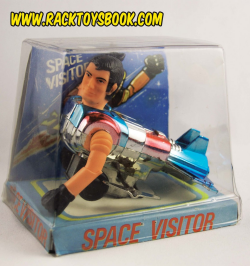 From toys that are “not quite” The Beatles, or Jaws, to a slew of unauthorized semi-Batman products, to bizarre mash-ups like the Italian “Space Visitor,” a robot with a MEGO Superman head, this is just a goldmine of shlock. The highlight is the MEGO-sized “Mr. Rock,” a fellow with pointy ears wearing a Star Trek-like shirt with what looks like the logo for The Pontiac Firebird. Although Rack Toys is a picture-heavy book, it’s still going to provide hours of entertainment. If you grew up in the 1960s, 79s or 80s, or if you have a healthy appreciation of Kitsch, this is the book for you. Rack Toys is a pure jolt of nostalgic eye-candy. We’d expect no less from the man behind Plaid Stallions. I can’t wait to see what he has planned for his next book. Actually, the “Mr. 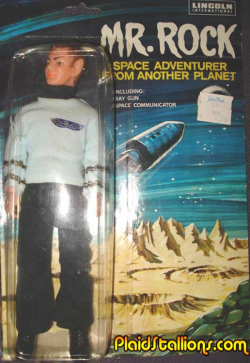 Rock” figure was manufactured and sold three years before the STAR TREK television program debuted. That means Gene Roddenberry was a dirty thief.